With more churches being closed down or demolished, congregation members now have to wait until its dark outside or meet in secluded places to continue practicing their religion. Bitter Winter has accessed videos and photos that demonstrate the sad reality of Christians in China. The situation is grave for both: the government-approved and house churches. 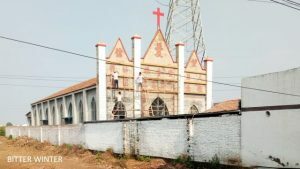 On September 10, Fuyang city authorities in the eastern province of Anhui secretly demolished a government-controlled Three-Self Patriotic church. As a result, its 100 odd believers now have to meet outside, braving the recent cold weather. A makeshift podium on the ruins of the demolished church in Fuyang. Anhui is home to the second-largest population of Christians in China. In Fuyang region, there are at least 120,000 Christian believers; therefore, demolitions and mergers are a massive blow for them. 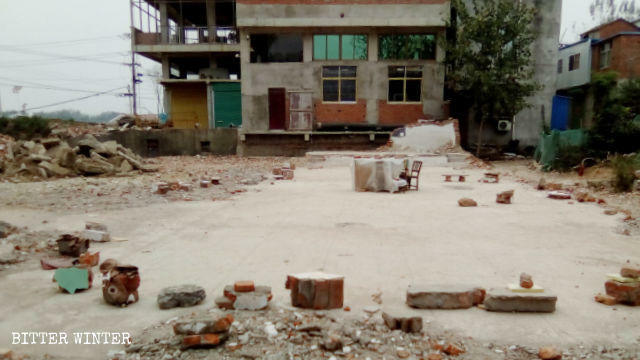 In the neighboring Shandong’s Zibo city, a Three-Self church was demolished in October, and its congregation is now forced to assemble in a gazebo near their village. To ensure they are not discovered, they wait until its dark to meet. The oldest amongst them is 93-years-old while the youngest is 60. Elderly Christians are gathering in a gazebo outside the village while it is dark outside. 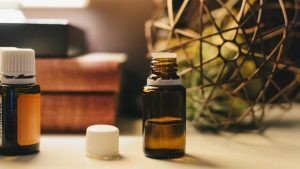 Compared to the Three-Self church believers who are still allowed to meet in the open, the fate of house churches is far worse. 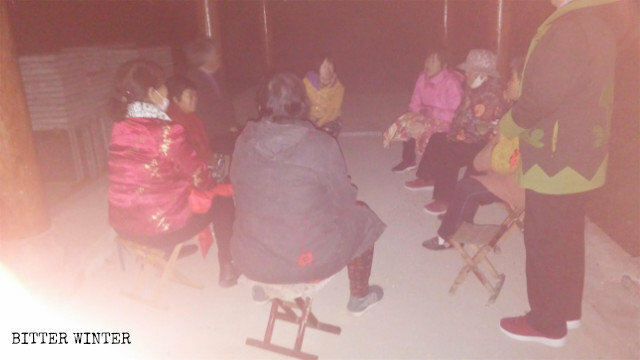 Believers from Xuchang city in Henan are now holding their gatherings in secret, sometimes in the forest, after their church was raided earlier this year.